One of the fascinating things about having one’s own blog – even if one doesn’t actually ever post on it very much – is looking at what you, the public, type into search engines to get here. You’re an odd bunch, you really are. A not inconsiderable number of you seem to be preoccupied with my marital status, if the frequency of visitors looking for articles containing the words ‘helen yemm divorce’ is anything to go by (anything on that subject that you may come across, incidentally, has nothing to do with me. There seems, surprisingly, to be another Helen Yemm…). Similarly, the popularity of my post on ‘Solomon’s seal sawfly’ never ceases to amaze. And I do hope that the person looking for “where to plant yew balls” found what he or she was looking for. 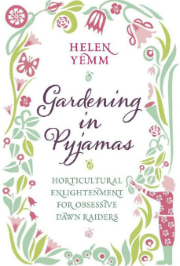 However, I may be being somewhat vain, but I like to massage my ego by assuming that at least a small proportion of you are looking for more information about the author of the Royal Horticultural Society’s brand new offering in the Grow your own… series, namely Grow your own flowers, now on sale (for delivery in January) via the RHS shop. In case you haven’t worked it out yet, that author is none other than yours truly. However (a little disappointingly) there is, apart from my name and a broadly grinning mug shot (not of my choosing) on the cover, not a lot in the book to explain to those who haven’t heard of me from my little corner of the Telegraph, who I am or where I have come from – no pithy little biographical titbits on the inside of the cover even, for some reason. …and then go to the RHS website and order the book which, incidentally, I did write all by my little self (apart from some snazzy little inserted POWs – that’s Pearls of Wisdom – in boxes from the RHS’s Leigh Hunt) and about which I am (not very secretly) quite proud. Next bit of excitement is another book (a distillation of my long-running gardening agony page in the Saturday Telegraph) Thorny Problems, due in March (Telegraph Books and Simon & Schuster), and which you can pre-order on Amazon here. 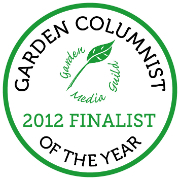 Anyway, watch this space – and I expect Telegraph Gardening will helpfully work up a bit of a sweat about it as well, bless’em. This entry was posted on Monday, November 29th, 2010 at 11:10 pm and is filed under Grow Your Own Flowers, Thorny Problems book. You can follow any responses to this entry through the RSS 2.0 feed. You can leave a response, or trackback from your own site. Icertainly know who you are,just hope you have woolly drawers under your nightie! Am saving hard – any chance of a discount? I posted lots of suggestions that I thought other people might enjoy reading. You’ve taken them out – to focus on selling you own? How kind spirited you are at this time of goodwill to all. Hope to see again before long – when perhaps you can explain why you didn’t bother replying to my Christmas card. I have no idea who you are, Annie, so all that stuff thanking me for flowers (that I did not send), and you sending me a christmas card (that I did not receive), for which I did not thank you – is a load of bunkum. Which is why I removed your comment, and will remove your next comment too, should you be unwise enough to add another one…. Happy New Year from Helen. Charming. I’d put your nightie on, get back in bed and try getting out the right side if I were you. For your information, I received some flowers from which the label had fallen off – I thought they were from you, since I was under the impression I knew how nice you are. It was hardly rude to thank you for them. Squabbling with your readers seems a mite unwise – and I rather doubt if you will sell many books that way. Apologies for the mix up here. I deleted Annie’s comments simply because they didn’t make sense to me. I do not, as far as I know, know Annie – nor did I knowingly receive a Christmas card from her, nor have I ever sent her flowers. Her claims that I had done so were thus somewhat baffling. The rest of Annie’s comment – recommendations for other gardening books – were an unfortunate casualty of my desire to remove the misleading information. In retrospect, deleting the comments probably wasn’t the best course of action, but I’m new to all this online commenting stuff and its not like there’s a handbook anywhere to tell you what to do when someone claims to know you on your own website when they don’t. So my subsequent narkiness with Annie was as a result of her accusation that I’d remove this information to promote my own book – I didn’t – and that she claimed to know me – when she doesn’t. I’m certainly not in the habit of squabbling with my readers online, in fact quite the opposite: I find the whole thing a bit daunting and this episode hasn’t really convinced me that its worth the hassle, actually. Anyway, I’m going to get back to your letters and get next week’s column done and dusted… and hope that no more oddities appear in this comments thread. that’s three times you’ve. Here’s a third answer: saxifraga granulata. I have only just caught up with the comments here. Strange though it may seem, I did not choose the photographs for this book (although I wrote the captions!) As far as I can tell the photograph in the middle of three on page 15 shows a white-flowered Dicentra, possibly ‘Langtrees’, quite at home in a woodland setting.